Have you ever tried to carry a 150-inch HDTV around with you? Plus, you need to pack loads of cables, then you have to find a place to set it up. And actually, that’s a very silly idea. But a mini projector isn’t. 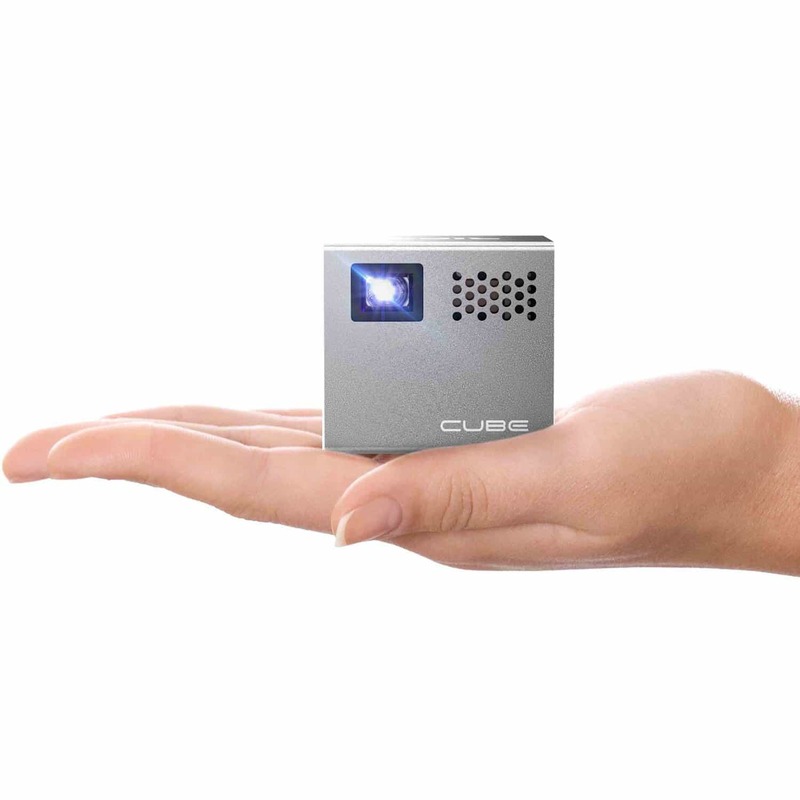 With a mini projector, you can transform isolating social situations into actually enjoyable experiences. So, rather than lose everyone to the glow of their smartphones, you can instead direct their attention to a shared screen. A screen that is capable of full HD video and gaming and displaying crisp text and anything else you can do with a smartphone or a laptop. You can have all that potential in a gadget the size of your coat pocket. To help you capture people’s attention and take them on a shared experience, let’s look at the best mini projectors available on the market. 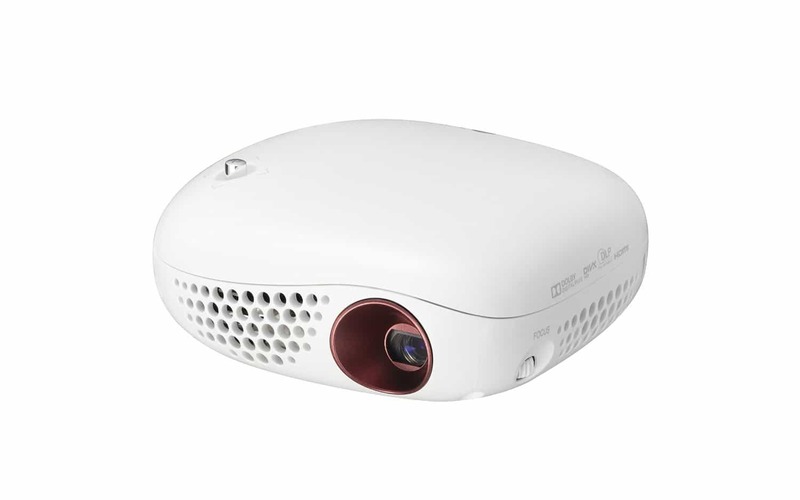 You’ll also find links to the best possible price for each portable projector. The two key factors to consider are the weight and native resolution. When looking for your new mini projector, always look at those first. By packing so much technology into a little box like that, it risks impacting the very features you want from a portable projector such as weight and resolution. Let’s look how each product stacks up against one another. You can immediately see that the native resolutions of these are far lower than the average consumer television. That’s nothing to worry about. Most will still play 1080 footage very crisp. If you don’t already know what that means, then you needn’t worry about it. Now, let’s take each product and take a closer look at each and every one of them. 50 inches in normal light environment. 100 inches in low light. 130 inch when you need to play movies on the side of your house to impress the neighbors. That’s a big screen to carry around in your pocket and it’s a small price to pay for such an incredible ability. You’re a walking cinema. And your pocket will only be 2 pounds heavier. It’s exactly the price you would expect a consumer-focused gadget like this. Putting it squarely in the price range as an ideal present for yourself or almost anyone. You won’t have the resolution of the far more expensive competitors, yet it’s far better than many. Due to it being a little more expensive and larger than ultra-portable versions, we’ve chosen it as our best pick for gaming on the go. From the larger size you gain a better resolution and, if you’re gaming, you’re likely near a power source and the size isn’t too inconvenient to carry. Plus, when you get kicked off the living room TV you can always set up your projector, point it at the ceiling, and game while lying in bed. A sleek Macbook Pro or a business laptop is the perfect size and shape to slide easily into a portable bag. The Epson PowerLite is the perfect companion for those who enjoy pulling technological magic out of nowhere. Plus it actually comes with a bag, too. Few projectors for business meetings look as professional as this. It would even look great on the boardroom table or as a small-footprint conference room projector. Regardless, it’s highly portable and you won’t look like a weirdo if you show up to any gathering with it. In fact, if you show up to a gathering with this then you’re automatically the hero of the day. Because the day just changed for the better. Whereas many portable projectors look gimmicky, the PowerLite will demand respect. It also demands an equally respectable price. But for your money, you gain a substantial piece of equipment with a 2600 lumen brightness so you can see it even in rooms that are relatively well-lit. Obviously, it works best the in the dark. But if you want a reliable piece of equipment that is always going to follow through, then the Epson PowerLite is an excellent choice. 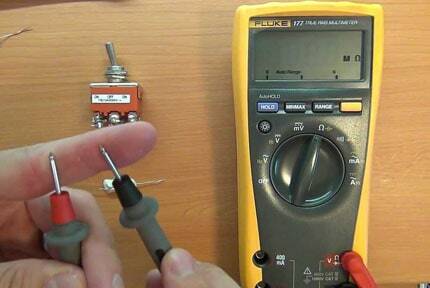 The key difference between amateur and professional equipment is not the maximum level of performance. The main distinguishing feature between pro and unprofessional equipment is actually reliability. If you’re doing presentations or just hate dealing with unreliable tech, then the Optoma ML750 is perfect for you. If you do presentations, you’ll be able to guarantee a cinematic experience each and every time. And any salesman or teacher worth their salt will tell you that the most important part of a pitch/lesson is drawing your audience in. 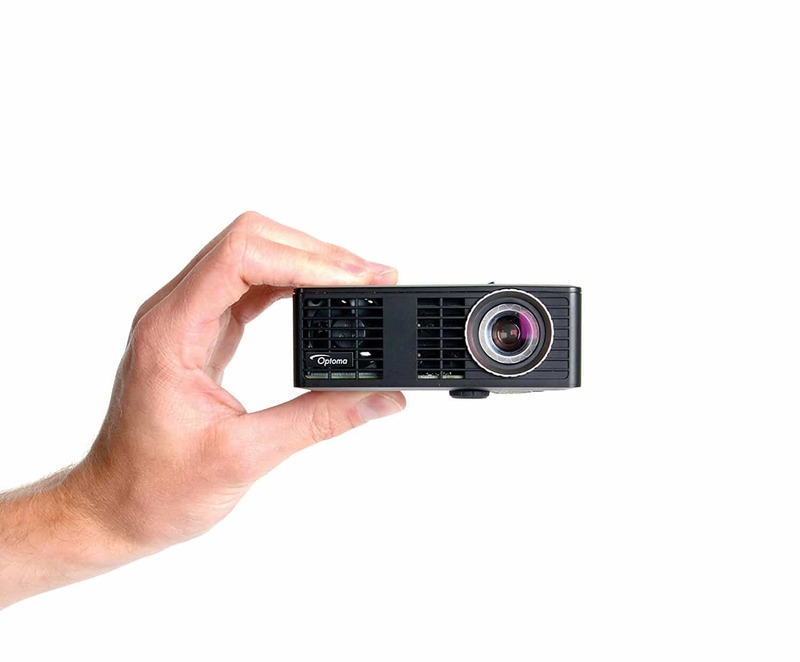 The Optoma is our top pick as ‘best portable mini projectors for presentations. Purely because the higher resolution and crisp projection result in extremely readable text. You could read a book off of it right before you watch a Blue-ray film on the side of your kitchen wall while you cook. 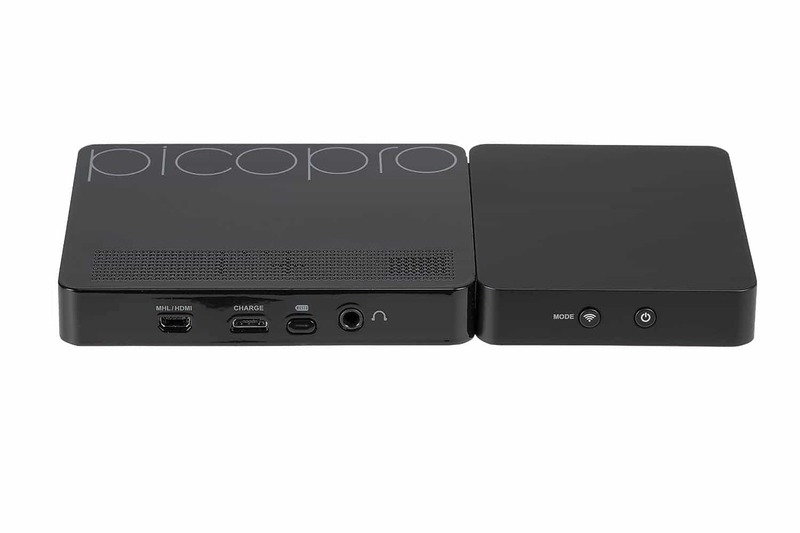 At a glance, the Celluon PicoPro probably wouldn’t reveal itself to be a projector. It looks like a Bond-era gadget with a flat, rectangular shape in which a small lens can be seen in one of the thin sides. On top of that, it literally shoots lasers! 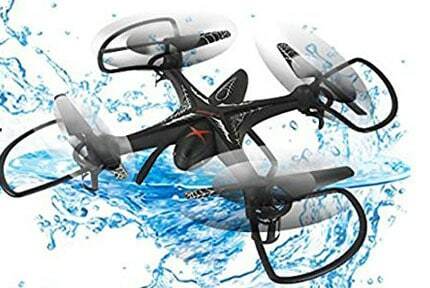 Just from that, you’ve got yourself a gadget that’s worthy of a spy or science fiction cinema. Celluon claims that to maintain a crisp image no focusing is needed. Meaning the 720p upscaled footage looks great anywhere. Plus the entire thing fits into your pocket. Meaning a coat pocket is all you need to carry it about. And a phone is all you need to stream to it over wireless. Or you can plug a HDMI cable into it to stream HD video from anything from a video game console to a laptop. Regardless, it’s exactly what you want from this sort of portable projector. 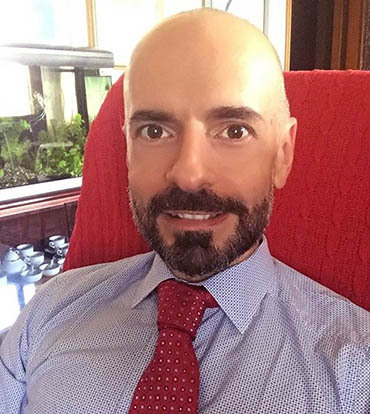 You can pop it out in the middle of a business meeting with clients or in the middle of a restaurant meal with family. But, while being ideal for full presentations in front of roomfuls of people, you might find it difficult to get a full-size image. It’s not very bright either. So, the lack of a focus, lack of Keystone, and only 32 lumens might make this projector a bit unreliable for formal situations. But whipping it out in the boardroom or team meeting would definitely get you noticed in a good way. Having a little projector that beams hi-quality video across the room is great. It summons the delight and admiration of everyone around you. But what good is it when it runs out of power in 10 minutes? Or doesn’t have a battery? And you’re just left sitting there with a cable hanging limply from your hand in a room with no power socket. With a table of people waiting for you to deliver on your “amazing idea”. That won’t happen with LG‘s PV150G since it’s our top pick for the best mini projector with battery. The price of it is roughly in line with the more expensive options on this list, but it’s a price that we’d argue shows that it’s a quality item. And at a price-point that keeps it within the consumer market. It’s the best mini projector for camping, by far, with a 100-inch projection that can run for up to 2 hours. If the battery lasted for around 3 hours then it would be the only projector on this list. But 2 hours is a little less than a full feature film. Sure, it’s 2 hours more than most projectors on this list, but 2 hours is just short of the average film length (2 hours 10) which is slightly absurd. So, if you remove feature films over 2 hours from the equation, then it’s absolutely great for traveling around with. Another thing to note is how big the projector looks in the product pictures. It’s actually tiny. Adorably tiny. You’ll have no problem sticking it into a bag or a coat pocket as you’re about to head off. We would recommend buying a small tripod for it and if you want to use external speakers with it you’ll need an adapter. 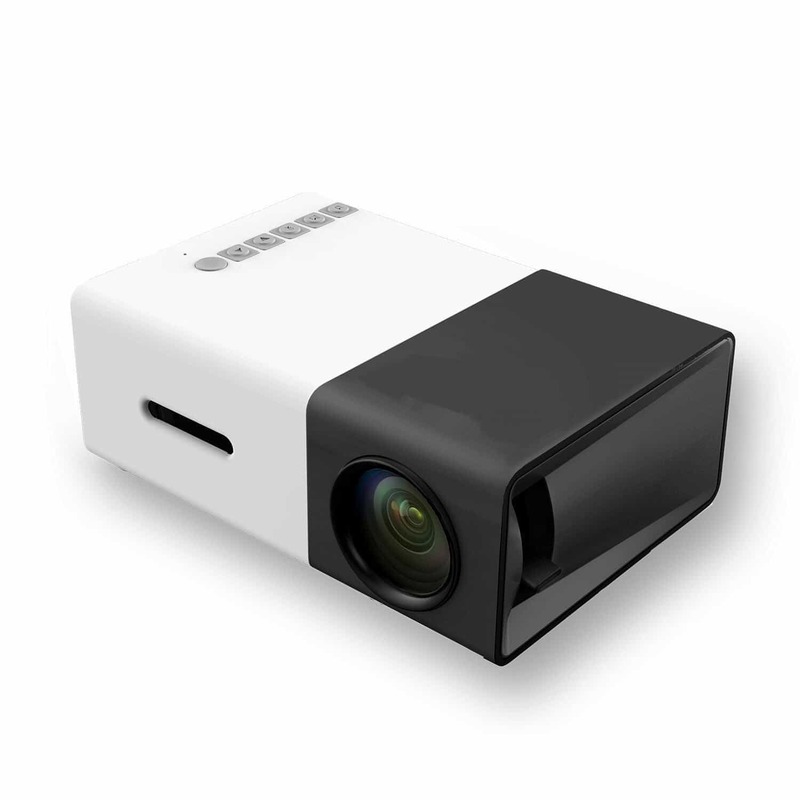 Many of the mini projectors on this list stretch the definitions of portable. Yet, the RIF6 Cube meets that description beautifully. Boasting a 2-inch squared micro footprint, 90-minute battery life, and fantastic projection quality. It throws out a 100inch screen from just a tiny 1.
an 8-pound silver cube that’s reminiscent of a GoPro. You can also buy a matching speaker cube and silicone protectors for both. However, for this incredible little cube, you are also going to have to cough up the cash. This level of convenience isn’t cheap. But the big price for a small gadget should fill you with the confidence to take the plunge. It’s the holy grail for parents. You can throw a video up onto the ceiling of your car, or a wall on the street, against the side of the shed, anywhere. Plus you can do everything else one can do with a projector, such as gaming and watching films. The 90-minute battery isn’t going to last an entire film. But it’s a fantastic option to have while transporting it or for watching YouTube videos on the go. You’re sold on the benefits of a mini projector by now. You crave the attention that it brings you. Your title as King Entertainer among your friends is a single purchase away. Your thirst for the promotions at work you’ll win over with your next-level presentations. It’s all making your mouth dry with the urge to buy. But wait. Those prices. They’re a bit high, no? Well, firstly, what do you expect for the kind of returns that buying the best mini projector brings? But if you still don’t have the budget to cover such an investment then we have some good news for you. Deeplee A1. It costs less than the majority of other life-changing gadgets available. Yet it still transforms how you think about how you engage with entertainment. A price this low comes with a few compromises, notably the resolution and image size. 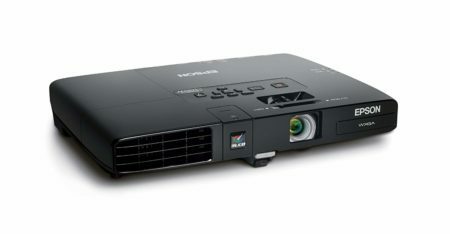 The native resolution is low even for a projector, and the recommended projection size for the best quality is 30 – 60 inches. And, realistically, the lower end of that quoted margin. However, at a quarter of the price of its rivals, it’s certainly not a quarter of the performance. The speaker is loud. The 400-lumen lamp is bright. It plays off both USB and HDMI, it displays text that is still readable, and the overall projection is crisp. And that’s important to note, even though it’s lower resolution, the image is still crisp. 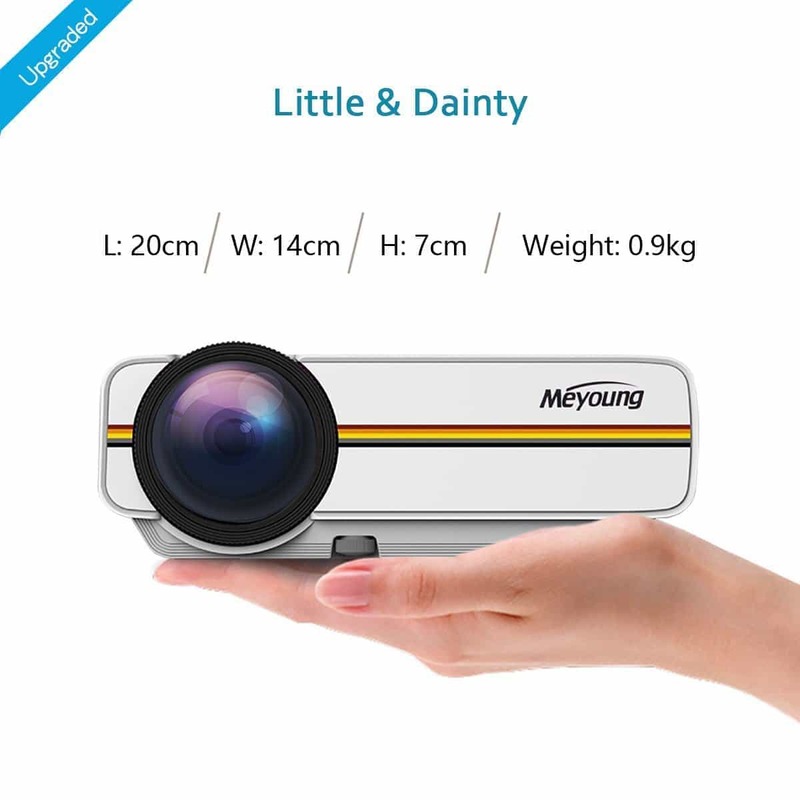 For anyone who is hesitant to take a deeper plunge into the world of mini projectors, then this Deeplee A1 is absolutely perfect for a first-timer. The best thing is that, since it’s perfect for children in every way, you can play around with it yourself. Then, if you decide to upgrade you can simply hand it down to your children. Let’s cover the main problem with buying a mini projector. You might know all the benefits of a more expensive projector yet you also might know that you won’t be using it regularly. Yet you still want access to a semi-decent piece of equipment when you need it. Many of the cheaper options are just too cheap to use for special occasions. That’s where the Meyoung PP comes in with a slightly higher price point yet not too high to put casual users off. That’s why we’ve put it firmly in the best spot for family events. There’s not too much to say about it. Which is good. It’s very much a middle ground in terms of quality, brightness, extra features, and screen size. This would also make a great test purchase for those who want to progress into the world of projectors. It’s a quality piece of kit, without all the bells and whistles of higher-end projectors. Which Mini Projector Is Right For Me? Buying the best mini projector is hard. Those little boxes of magic that turn blank walls into the favorite films of friends and family demand a good knowledge of projectors to choose. There are all sorts of tactics that manufacturers use to trip you up. They try to make you assume their projector will create a full cinema experience with crystal clear quality. Except that native resolution might be 300×200. It’s easy to fall prey to these efforts, especially if you already know a bit about computers. Since they use exactly the terminology you know to trick you. 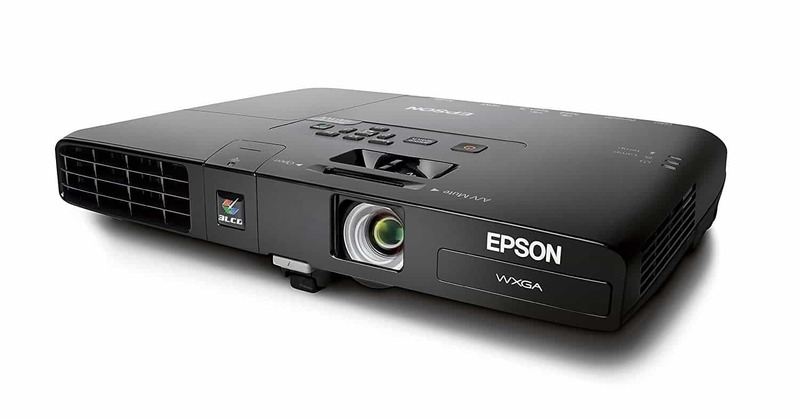 Native resolution is the most important factor when quickly comparing projectors. Seller’s will use phrases like “1080 ready” in order to draw attention away from the fact that their projectors aren’t actually HD. Yet, it’s hard to compare projectors to TV’s because they’re entirely different methods of projecting light. Always look for the native resolution, but just know that it probably will project 1080 footage just fine. An obvious consideration for mini projectors who must be as portable as possible. Why design a small projector if you can’t carry it around after all. Weight won’t change too drastically between models. But the extra pound of weight can make a real difference when out and about or hike up to a campsite. So keep it in mind along with native resolution. Power outlets are everywhere because battery technology isn’t great. And it’s no different in the world of miniature projectors. The best you’ll find is a battery life of up to 2 hours – which is still less than a feature film. But great for a couple of hours of YouTube videos or mobile phone gaming. We wouldn’t linger on battery life too much if we were you. Though, it’s definitely great to have that little buffer of power. For when the power goes out or you just want to watch an episode of your favorite TV-show while on the move. Keystone adjustment as described in this Wikipedia article is perspective distortion. A projector with the option to correct for this is extremely useful because it gives you more flexibility to position it. Otherwise, you’re going to have to account for height when setting it up. We’d highly recommend this feature, but it may be lacking on the budget end of the spectrum. This is difficult. 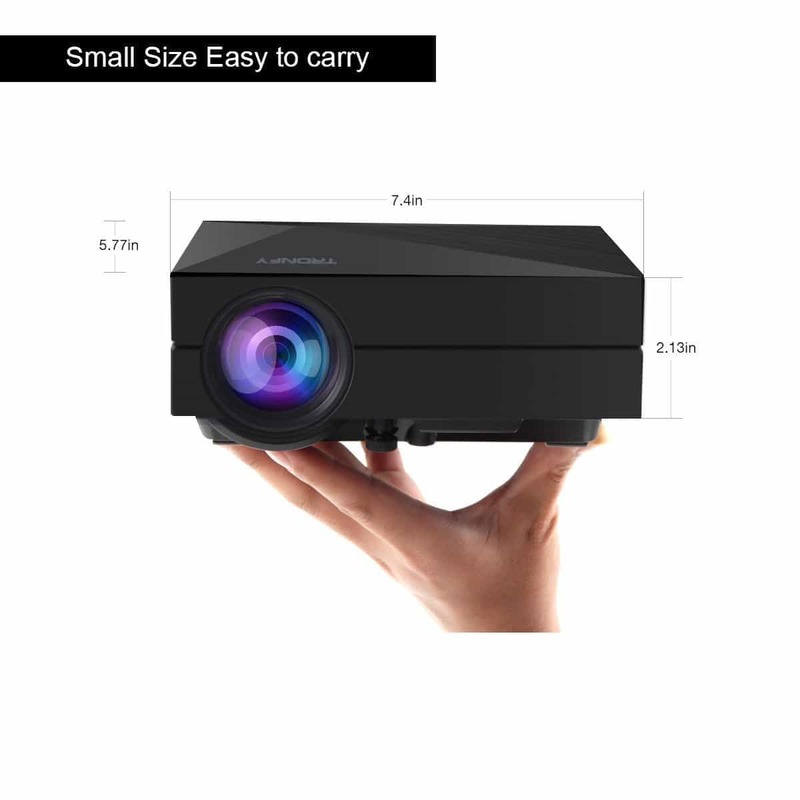 All of the above mini projectors are incredible since even the cheapest version adds a whole new dimension to your life. The Meyoung Portable Projector almost seized the highest spot at the top, because it appeals to more people. Yet, you just can’t deny the quality and the Epson Powerlite 1761W. Sure, it doesn’t have any battery life at all, which is where the LG PV150G is a clear winner. Yet it’s one of the few projectors that has been designed for the real world. It uses the tried and tested the design of a modern laptop to fit comfortably into the majority of today’s bags and satchels. It also has a fantastic quality projection. It’s pricey, but the Epson Powerlite truly is the best mini projector of 2019.